Image courtesy of Paul Carter (Carter Capture). North Shore Bombers vs. Manly-Warringah Wolves – Gore Hill Oval on Saturday, April 13. For the North Shore faithful, there was plenty to be excited about ahead of Round 2. The Bombers Premier Division side were coming home to Gore Hill Oval after more than a year on the road. It’s been completely rebuilt, and you wouldn’t recognise it compared to how it was. It now runs roughly east to west, with a new clubhouse and rooms stretching on the south-west pocket. The quagmire at the northern goal square and the concrete cricket pitch are gone, and won’t be missed. On top of it all, there is the new synthetic surface too. In seasons past we’ve seen dustbowls at Gore Hill with players getting cuts and grazes every time they went to ground. Now it’ll still be green by late in the season, and it’ll stay open when it rains. Conditions were good on Saturday for the second round. It was an attractive contest for our match of the round, as the Bombers played host to local rivals Manly. The Wolves had given the Bombers plenty of grief since going up to Premier Division, but after the Bombers had a big win over Inner West Magpies in the opening round and the Wolves had gone down to Camden, the Bombers went into this clash as firm favourites. The Bombers were quick out of the blocks, and controlled proceedings for much of the opening term. Some wasteful finishing would count against them, but the Wolves found themselves starved of possession and rarely ventured inside their forward-50. But for all their dominance, the Bombers could only manage two goals. A major score after the siren to Manly cut the North Shore lead to 12 points at quarter time. The Wolves were still close enough at quarter time to fight their way back into the contest. It didn’t take long into the second for the Bombers to power away to a match-winning lead. Backing themselves in tight contests, winning the contested ball more often than not and finding their targets with pinpoint accuracy, the Bombers were asserting themselves and showing exactly why they are title contenders this season. Five unanswered goals told the tale, as the Bombers raced to a 40-point lead at the long break. By the time the players returned to the field for the third quarter, day was turning into night. The Bombers were a team on the way up and Andrew McConnell was literally on the rise as he flew for a magnificent speccy on the wing early in the third term. The Wolves were unable to trouble the scorers in the third term, while the Bombers were in complete control. A return of 6.8 underlined their dominance, which could have been even more had a few shots not been squandered. It looked a mismatch around the ground, the lopsided stats telling the tale as the Bombers extended their lead to 84 points at three quarter time. The Bombers were turning on the trick shots early in the last term, the highlight being a run by Erol Sertbas that anyone watching would do anything just to be like him. Five goals to the Bombers completed the contest, and although the Wolves would grab two late goals, the Bombers’ night to remember was completed with a 105-point result. Ned Campbell was in the thick of the action, finishing with four goals in a best on ground performance, while Kyle Devlin and Lachie Borg also featured prominently for the Bombers. Two games, two 100-point wins – it’s been a great start to the season for North Shore. Last year they led all the way through the home and away season but faded in the finals. This year’s quest to go all the way through the season is off to a great start, but there’s some tougher matches to come. Lachlan Behagg, Alex Fraser and Levi Brain worked tirelessly for the Wolves in the face of adversity, but it wasn’t a great day for the Wolves. Winless after two rounds, the maroon and whites have plenty of work to do over the Easter break to get their season back on track. 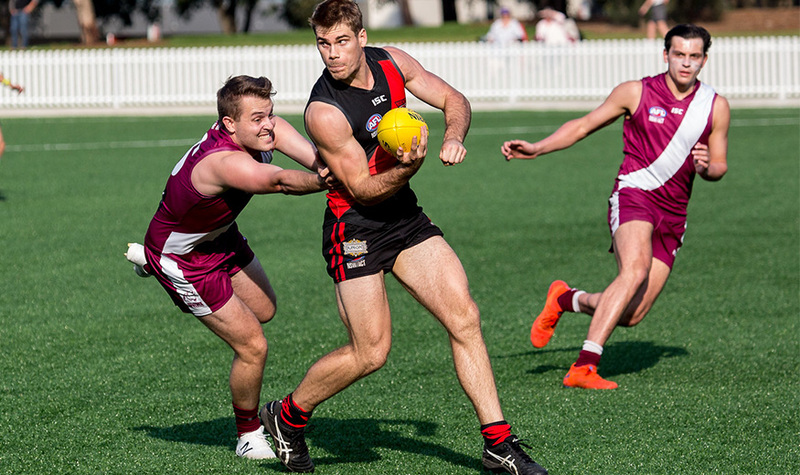 In other Round 2 matches, Sydney University dominated from start to finish to record a commanding 91-point win over Camden at Fairfax Reserve. Inner West Magpies had a shock half-time lead against defending champions UNSW ES at Picken Oval before the Bulldogs took control in the second half to win by 39 points. East Coast were 83 points too good for a disappointing St George at Olds Park. Pennant Hills had to dig deep against a persistent UTS AFC side in a high-scoring shootout at Trumper Park, but the Demons got the job done by 35 points. Manly-Warringah goals – T Wright, A Pilat, A Adams. Manly-Warringah best – L Behagg, A Fraser, L Brain, G Benbow, C Bousamra, D Meadows.